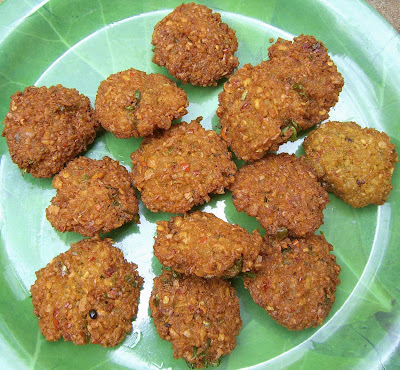 Aama vadai is a south indian speciality snack that is prepared on every single occasion. Aama vadai, payasam, and obbattu are the traditional trio for all festivals including Diwali and Pongal. 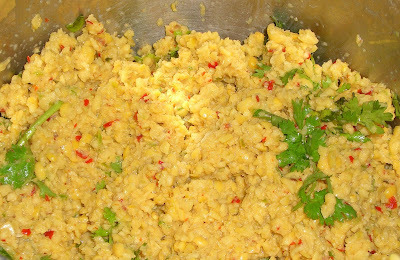 There are a lot of variations in preparing these vadais. It depends on the proportion of dals used. This is my entry to 'My legume love affair - event' hosted by Susan of 'The well seasoned cook'. Thanks to Susan for hosting this event. This aama vadai is my mom's recipe. Here is the recipe. Soak Toor dal and Channa dal together in water for 3 hours. Add chopped coriander leaves/cilantro and mix dal well. Make small balls and press to flatten a little. Deep fry both sides until it turns golden brown. 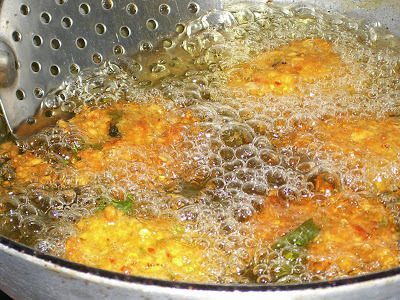 Variation: Mix chopped red onion and deep fry the vadai. my mom makes the most amazing parippu vada and i just love it! have never tried it myself..
nags: You can try. I did not try until last diwali. Its not tedious, but time consuming. sagari: Yes. Very much. I love this for this cold weather. Asha: Thanks Asha, Kadale bele vada is also my fav. My mom used toor dal more because, it will make the vada crunchy. I am very very happy to see your comments Asha. Thanks for dropping by. 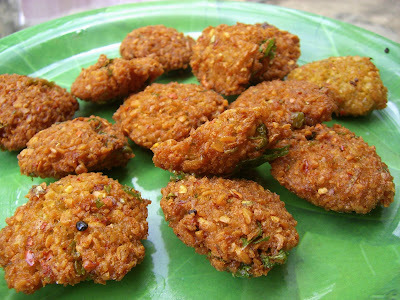 Parippu vada is my favourite too....good entry for the event. Hi Thanks for the recipe. I am going to try it tomorrow for navratri. However it would be good to also know what could potentially go wrong e.g. what would make the vada hard, how can it be made crisp. A few tips please. Drain the dal and then grind it. The water that is retained inside of the dal itself is sufficient most of the time. That is one point you have to remember. Then, try to make small vadais. Make a ball gooseberry size and then flatten it and then fry it in oil in medium heat. You can do 3 or 4 at a time. Let me know how it came out. thanks for trying my recipe. Thanks for the recipe, I did it over the weekend. My aama vadai perfectly done. Crispy and taste. I added 1/2 egg to ensure the vadai stand together. You can see my experiement at Patyskitchen. Thanks ya.